Good oral health involves more than keeping your teeth cavity-free. You need to keep your gums healthy, too. A growing body of scientific research continues to reveal significant relationships between periodontal health and systemic health. People who battle periodontal disease are at greater risk of heart attack, stroke and even diabetes. Your gums are designed to fit snugly around your teeth. Periodontal disease, also known as gum disease, begins when plaque forms around your teeth. Plaque combines with saliva and turns into tartar over time. This tartar irritates the gums and releases toxins that create inflammation and infection in the gums. This destroys the snug fit between teeth and gums and results in the creation of deep pockets. These pockets allow more room for bacteria to accumulate and if left untreated, can result in gum recession, bone degeneration and ultimately, tooth loss. removes tartar from your teeth and their roots. 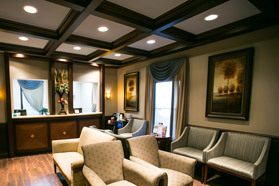 We typically do this over a couple of visits, and we administer a local anesthetic to keep you comfortable during treatment. The local anesthetic is delivered using an Onset Anesthetic Buffer, which results in little to no stinging upon injection. An antimocrobial agent such as Arestin often is used in conjunction with the root detoxification procedure to reduce bacteria around the gums. It is important to remember that regular dental cleanings aren’t enough to combat periodontal disease if you already have it. Deep cleanings are necessary because they go below the gum to remove buildup from your teeth’s roots. Gum disease can’t be cured; only controlled. Good at-home care, combined with more frequent professional cleanings every three to four months help prevent recurrence of this disease.